California became the first state in the country to ban smoking in nearly every workplace; effectively banning smoking in indoor public spaces. California's workplace smoking prohibition was enacted by AB 13 and became law in 1995 (Labor Code 6404.5). Restaurants were included in the ban, and bars, taverns, and gaming clubs were phased in by 1998. The law covers all "enclosed" places of employment, therefore, patio or outdoor dining facilities may allow smoking. While California's law is one of the most restrictive in the nation, a number of exemptions are allowed (see below). Many local jurisdictions, both county and state, have closed the exemptions through the enactment of local ordinances. 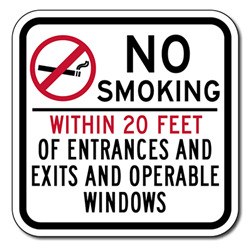 In addition, smoking is only permitted 20 feet away from entrances, exits and windows.